Wedding planning was my jam. I seriously loved the researching, the venue hunting, and every step of the planning process. But wedding dress shopping made me so nervous. Why? Because the closest thing I could compare it to was prom dress shopping. And I hated prom dress shopping. I’d get so insecure over how much my hips were sticking out, or the size of the dress I was trying on. As much as I love shopping, I always dreaded dress shopping, and I just assumed wedding dress shopping would be the same. 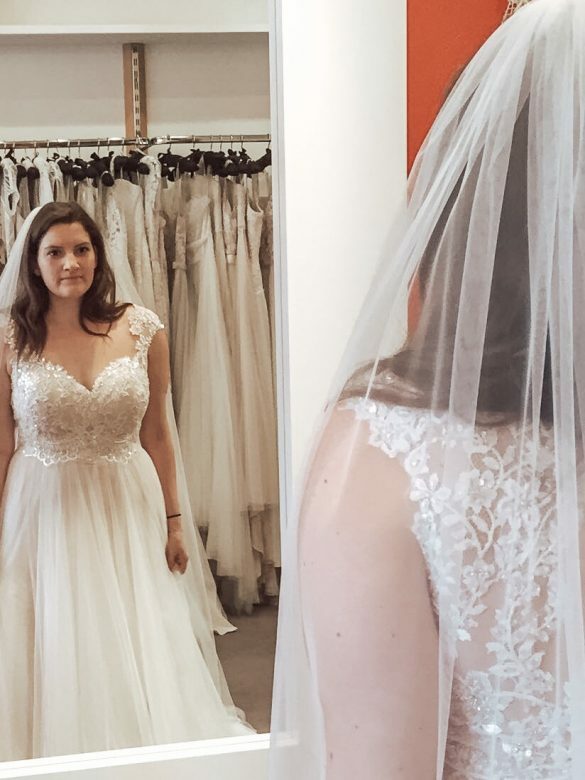 It turns out, I loved how special I felt, and I adored trying on all of the stunning dresses; it’s nearly impossible to not feel like a princess when twirling around in wedding dresses! It ended up being such an enjoyable experience for me that I want other brides to enjoy it just as much as I did. So here I am, sharing my wedding dress shopping experience and my tips for finding the perfect dress. 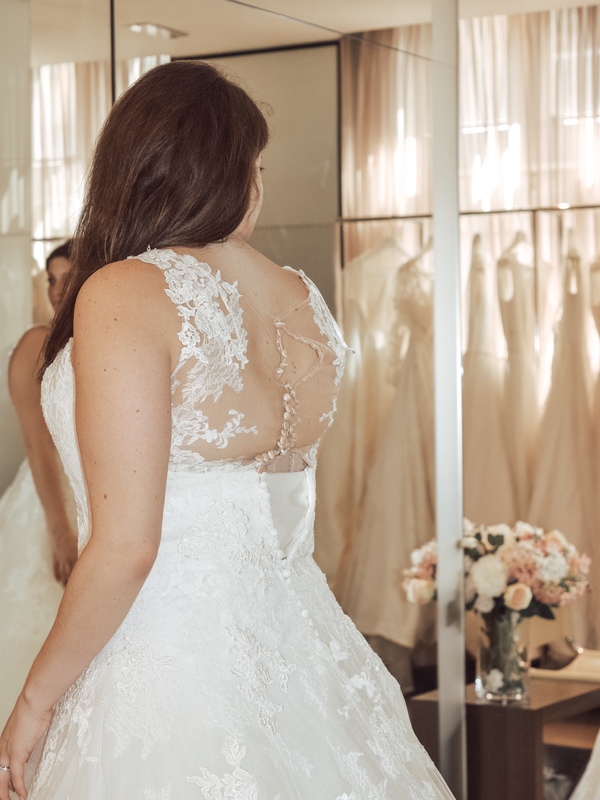 If you’re a bride to be, read on to prepare for your wedding dress search! 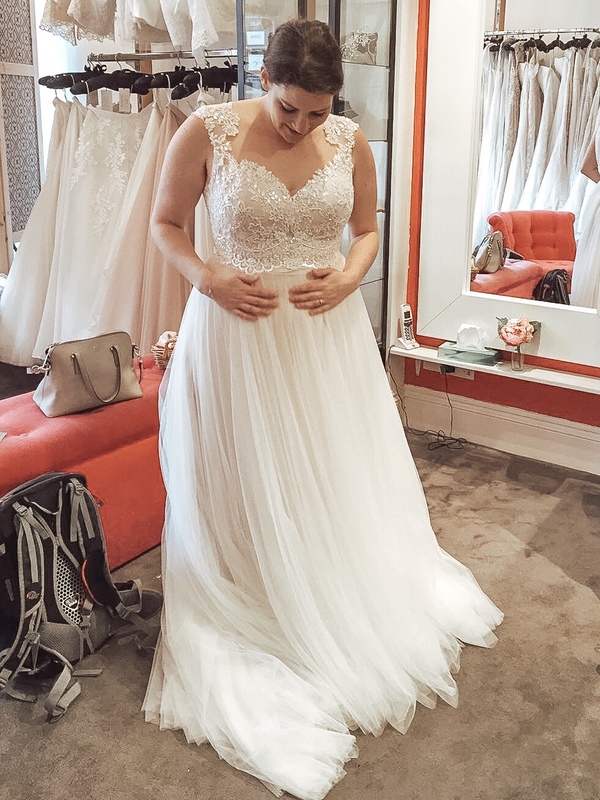 While I was looking for a wedding dress, I visited 3 wedding dress retailers – 1 designer flagship (Pronovias) and 2 boutiques which carried multiple brands (Boa Boutique and Emma Elizabeth Bridal). I personally found that I liked the experience in the boutiques better; not only was there a larger variety of dresses and styles, but the experience felt much more tailored to each individual, as opposed to a rather rushed and robotic experience at the flagship. I probably tried on a total of 12-15 dresses during my search. At the second store, I found a dress that I really liked. I wasn’t obsessed, but I think I could have been once it was tailored to fit properly. 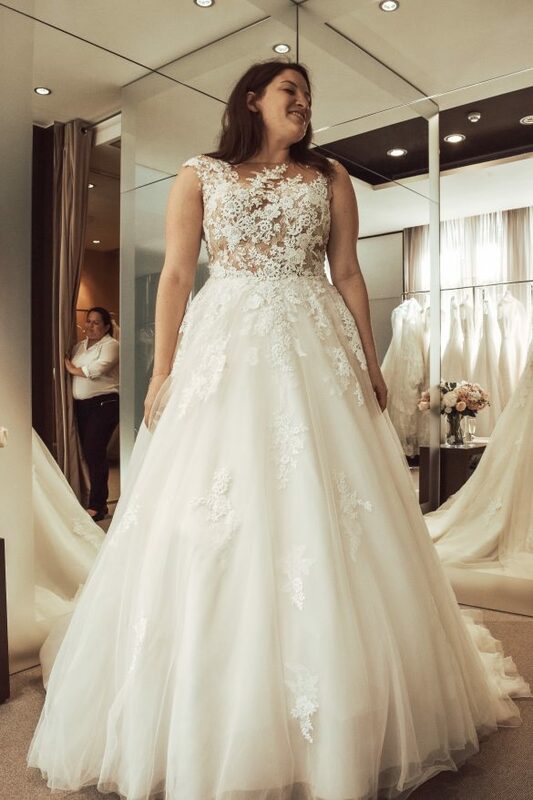 I already had my third appointment booked, so planned to go to that and, unless I found something I liked better, would purchase the dress from the second shop. Thank goodness I didn’t cancel that third appointment because I ended up finding the perfect dress there, which is the dress I purchased! Now when I look back at photos of the one I was going to settle for, I can’t believe I almost missed out on my wedding dress. 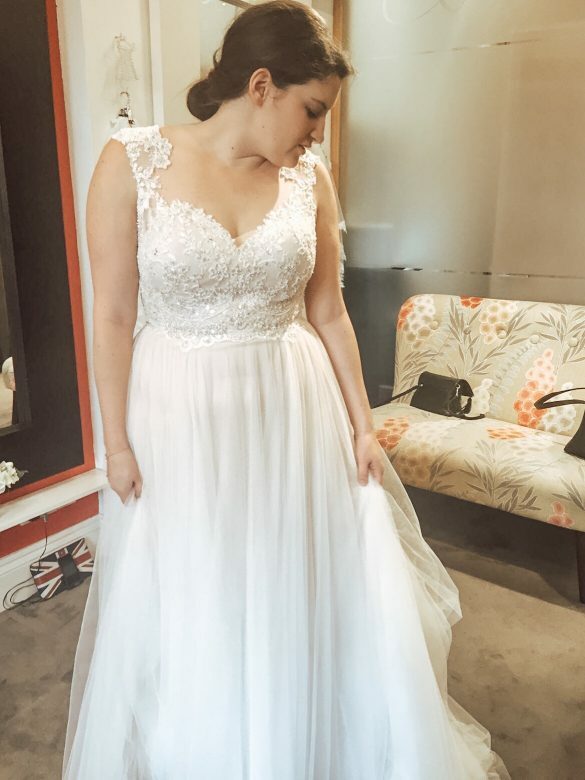 I purchased my Watters dress from Emma Elizabeth Bridal in Twickenham. The dress was full length with a moderate (but manageable!) train. I went with ivory as the color, just like I wanted, but ended up purchasing a dress that had beading. When I first arrived at the store and saw it in person, I was a bit disappointed because I didn’t notice the beading in the photos online. 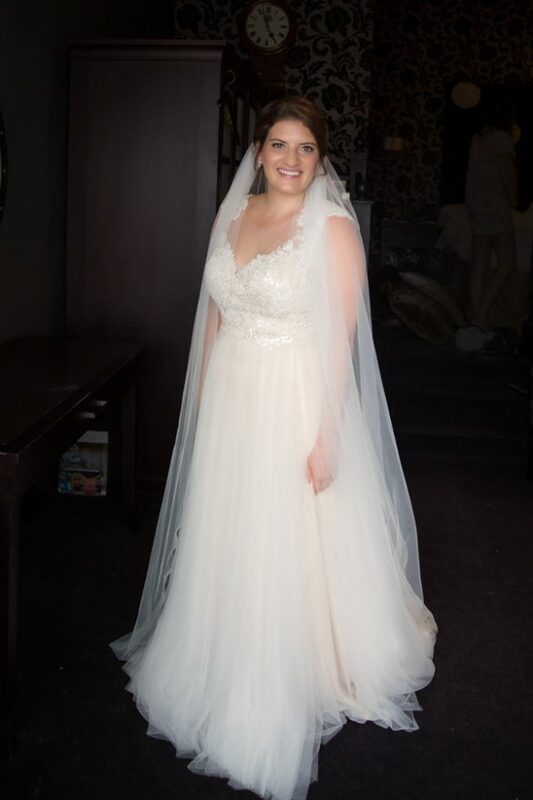 While I initially thought I didn’t want beading, it ended up adding the perfect amount of subtle sparkle and glam to make this the perfect dress! 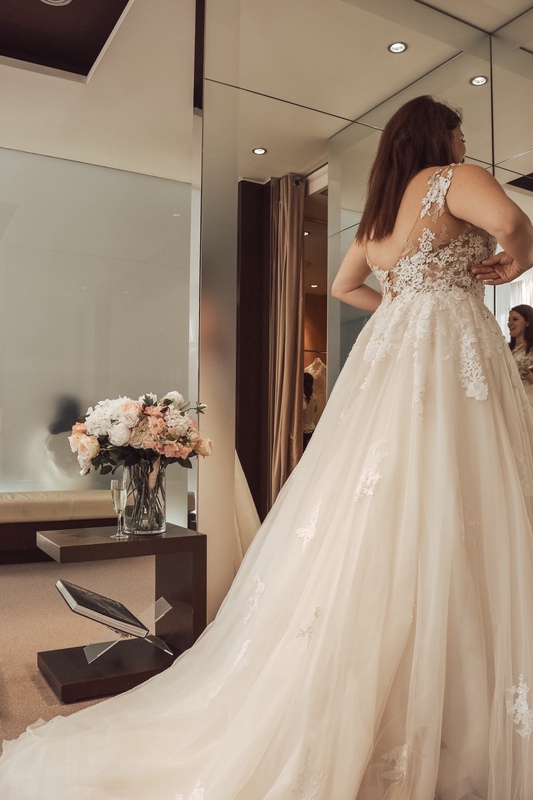 To be honest, I didn’t really know what I wanted when I started looking – after all, I had never been wedding dress shopping before or tried on any wedding dresses! However, as I tried on more and more, I began to understand what I really did want, and what I was willing to compromise on. 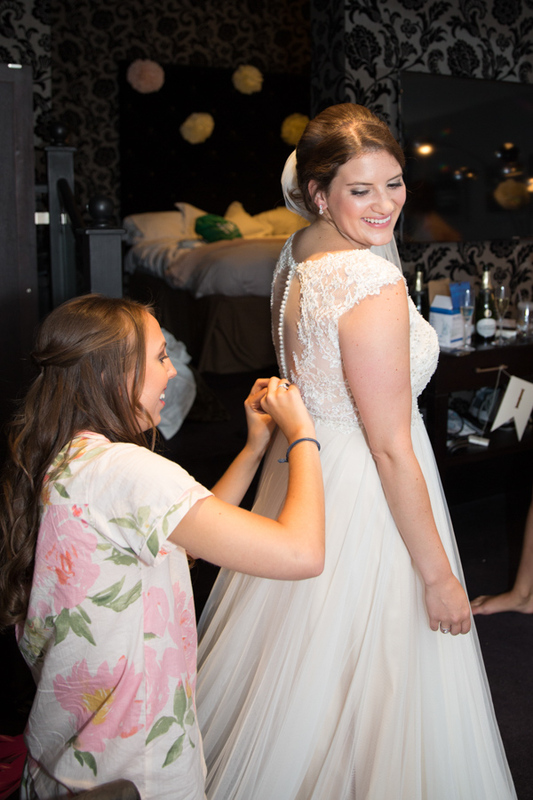 And that led me to find the most perfect dress, which I happily wore on my wedding day, with probably the biggest smile I’ve ever smiled! I went (a little) over budget which is no surprise to anyone who knows me. But, the moment I saw myself in the mirror, I knew it was the one. And finding ‘The One’ is one of the best feelings in the world, which is why I’m here to help you find YOUR One! 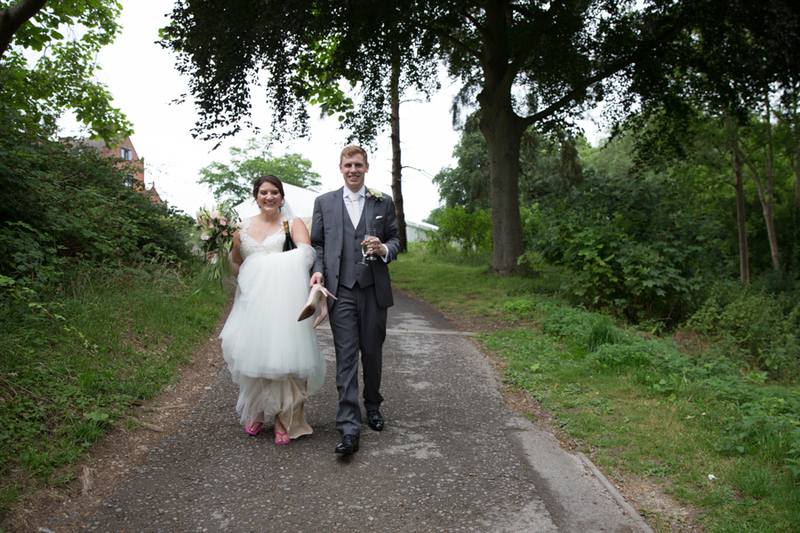 Read all about my English Country Garden wedding! 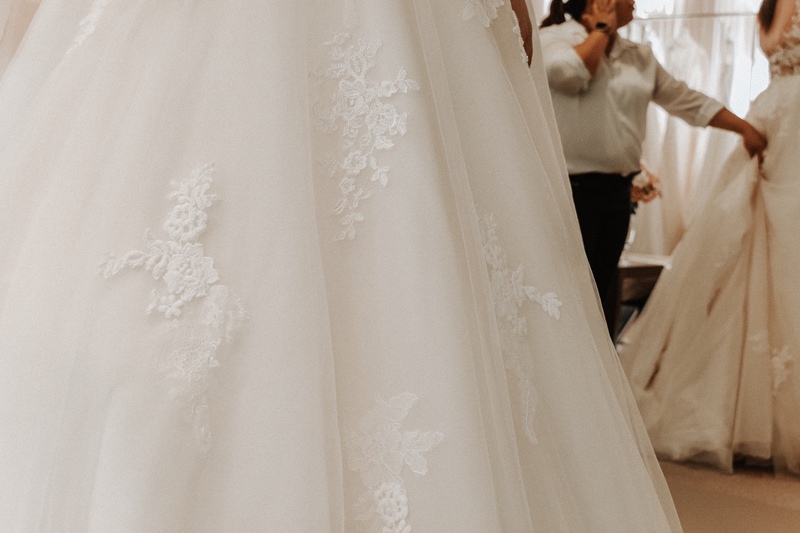 Each wedding dress specialist will offer a unique experience, so it’s important to consider what type of experience you are looking for in your search for The One. If you really like the style of one designer, it might be wise to visit their store in order to try on a range of their dresses. If you aren’t sure what you want, I would say it’s best to go to a boutique which carries a wide range so you can try plenty of different styles. Some stores also have strict rules on photos, the number of guests you can bring, etc., so it is important to do research ahead of time. Choose stores and boutiques that you feel comfortable with, whose selection you like online, and which appear to offer an experience similar to what you are looking for. Deciding where to look for your wedding dress is the first step towards securing the perfect dress! As fun as it can be to play dress up in expensive dresses, wedding dress shopping is not the time to do it. While going to a luxury dress shop where you can try on dresses you cannot afford might give you more experience dress shopping, and a better idea of what you want, it can also set you up for disappointment. Dress shopping is already a very overwhelming experience; throwing in dresses that you will never actually buy is just a waste of time! Make sure you check the stock of boutiques you are planning to visit to make sure they carry styles within your budget. Of course, it’s totally okay to go over budget if you end up deciding to do so (I did), but it’s never wise to start well above your budget. 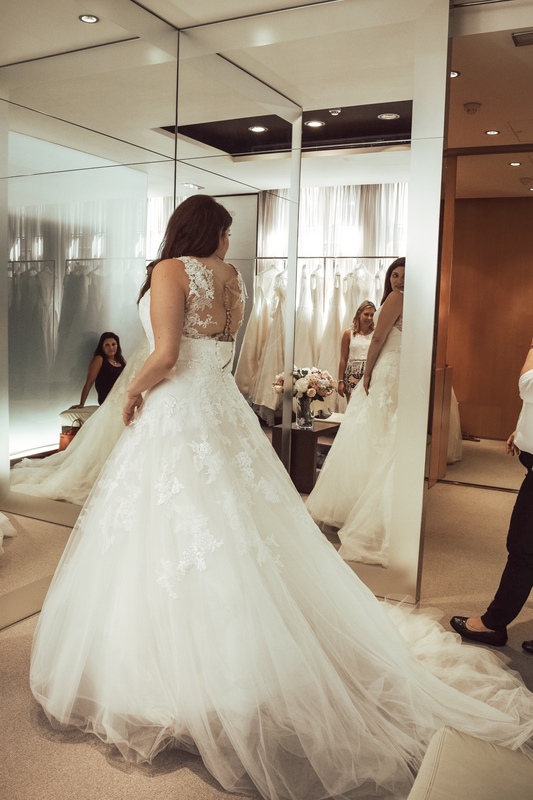 Read reviews from real brides-to-be on their experience at the stores you are planning to visit during your wedding dress search. This will help set your expectations for your appointment. How many other brides will be in the shop at any time? How intimate is the setting/how large is the shop? Is there a limit on how many dresses you can try on? Do they serve champagne? Etc. This information may not be available on the store’s site, but other shoppers will definitely share on review sites! When looking for reviews, I recommend sites like Yelp!, Google, and Facebook, where shoppers are more likely to be very honest. It’s possible that wedding focused sites or the boutique site will only show the positive (or at least a filtered look at) reviews, so looking somewhere where you’ll find ALL the reviews is better for gauging what your experience will be like. Many shops will ask you to browse their collection online and name some dresses you like. This is definitely an important step as it gives you a look at their inventory, focuses your attention on what you might want, and gives the shop a starting point. I highly recommend doing this before each appointment, but also going in with an open mind. If you pick a dress online and absolutely hate it on, let the shop assistant recommend something else. Or, if you don’t like the way it looks in person on the hanger, still give it a chance. I almost didn’t want to try on my dress because I saw it had beads (which I didn’t want), but I knew it was the one the moment I slipped it on. The shop assistant helping you find your dress wants to do exactly that, so help them out and vocalize your feedback. Be honest about everything, from colors to necklines to accents like bows or sashes. If you are honest about what you do/do not like about each dress you try on, the shop assistant can better help you find the right one. 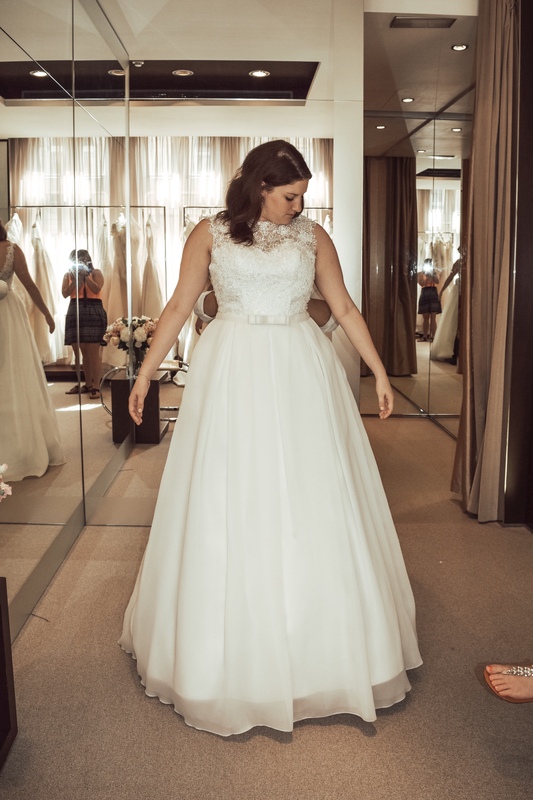 Being honest over the course of my appointments helped the shop assistant narrow down the shape of the dress I wanted, which I didn’t know going into the process. You are not going to agree with every single shop assistant who helps you find a dress. However, don’t let that discourage you. If they think you might like something based on what you are saying, give it a chance. A bad store assistant can definitely ruin your experience, but having a different opinion does not make someone a bad store assistant, which is why you should always give them a chance. If you really aren’t seeing eye to eye, remain calm. You may be able to kindly ask for a shop assistant who has a style more similar to yours; alternatively, you can finish off your appointment and request to make another one with someone else. This goes back to my advice to go in open minded. Wedding dresses are so different to any other item of clothing. Styles that you may not like traditionally could be perfect for you in wedding dress form. Whether exploring different bodices, different fabrics, or different shapes, try as much as you can so you can really understand what you do (and don’t) want. This is probably the most controversial tip on this list, and I totally understand if you choose not to follow it. After all, some brides have a very limited amount of time for finding a dress and may only be able to visit one shop. Others might fall so in love with a dress that they want to buy it on the spot. Every bride is different! However, based on my experience, this is the number one tip I recommend to friends who have the flexibility to make multiple appointments. If it’s truly The One, it’ll still be The One after two or three more appointments; but, you never want to wonder what could’ve been? after picking a dress early on. You’ll feel much more comfortable picking your dress after having others to compare it to, and you’ll also have a better understanding of what you want. Then, if your original favorite still meets that criteria, you’ll truly know that it is The One for you. 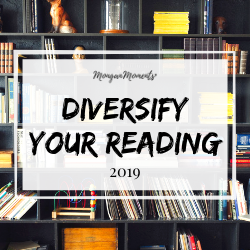 While it’s important to try on a variety and visit multiple shops, it’s also important to know that you need to make a decision at some point. You can always keep looking. Designers come out with new dresses every season, different stores carry different stock from different brands, etc. It’s possible for there to be no end to your dress shopping experience, unless you decide to settle. I say ‘settle’ because that’s kind of what you are doing – you’re deciding that the dress you love the most is going to be your dress. Because you can always convince yourself that you might find something better, but that doesn’t mean you actually need to go out looking for something better. That energy is much better focused on other aspects of wedding planning! Choose the friends and family who come shopping with you wisely, and decide which opinions really matter. If you bring your sister along and she knocks down every single dress, consider if you actually want to take her opinion into consideration. If you know that you won’t be comfortable if your mom doesn’t also love your dress, then ensure you get your mom’s opinion on every dress. But you cannot take every single opinion from every single person into consideration, or you will literally never find a dress. So prioritize. And remember that, at the end of the day, it really only matters how YOU feel in your wedding dress! Ah, the pre-wedding diet. Do you know how many times I started (and stopped) dieting leading up to my wedding? Or how many times I started an incredible fitness plan just to give it up a few weeks later? Although it’d be great to dedicate every second of our time to planning and preparing for the perfect wedding, that’s unfortunately not how it works. Life happens. Choose your wedding dress based on how you look in it when you try it on. If you lose some weight before the wedding, that’s great! That’s what alterations are for. But the last thing you need is to be stressing over losing an inch on your waist so your dress fits the way it’s meant to. Don’t do that to yourself! Focus on which dress you love based on your current, already beautiful body. 5 // Size doesn’t matter! While prom dress shopping in high school, I used to refuse to try on the bigger size because I was embarrassed. Please don’t be 16 year old Kelly when trying on wedding dresses! Your wedding dress will be custom fit to you, so it actually doesn’t matter what the number on the tag says. I intentionally went up a size so we had more room to work with in customizing the dress to the fit I wanted. Ignore the number; focus on how you feel and, when the dress comes in, work with the tailor to make it perfect! 6 // Remember the absolute most important thing about your wedding dress is that it’s YOUR dress! At the end of the day, it doesn’t matter what color your dress is, how much you spent, or whether you bought it straight from a designer or second hand. What matters is how YOU feel. As long as you feel confident and comfortable and absolutely love your dress when you look in the mirror, the other details mean nothing. Nobody is going to know the price tag on your dress; they won’t even care when they see you looking radiant and genuinely happy on your wedding day! One of the most important things that I realized while searching for my wedding dress was that there will always be more dresses. There will always be a better dress, a cheaper dress, a dress that is even more ‘you’. But that doesn’t necessarily mean that you’ll find that dress. You can keep looking forever and the above will still be true: there will always be something better. Once you find the perfect wedding dress, you have the opportunity to work with a tailor to make it even more perfect. Take advantage of that! Whether it’s the length or the tightness around your waist, be 100% throughout the alternations process. It takes time to make some of the changes but, if you’re honest up front, you will likely have that time. In the end, you’ll have a perfect YOU sized dress! 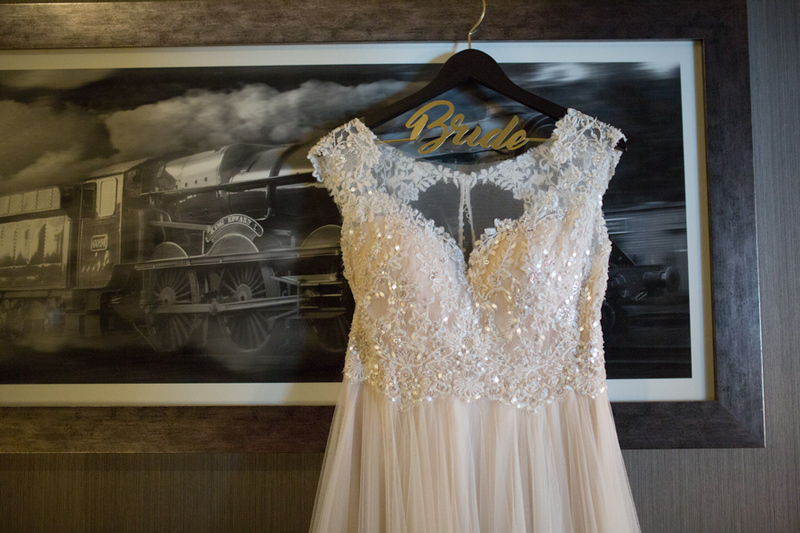 When you pick up your dress, ask about pre-wear care. You likely won’t have to do much, but it’s important to pay attention so your dress looks its best on your big day! Whether discussing steaming techniques or how long to air the dress for, speak to a professional so you know exactly what to do in the days leading up to your wedding day. After the wedding, look into a dress preservation service, where they will clean the dress and package it for long-term storage. 4 // Enjoy your big day! Our wedding ceremony started at 4:00pm. My dress was dirty by 4:45. But I had an absolute blast on my wedding day! Yes, pictures are important. And you’ll probably have pictures taken throughout the entire night. But, prioritize your enjoyment of your big day over having the cleanest, most pristine dress ever at the end of the night. My dress was stepped on (usually by me), the bottom was a different color after being dragged around in grass all day, and a couple of friends definitely spilled champagne on me. That’s what the cleaning and preservation after the wedding is for. 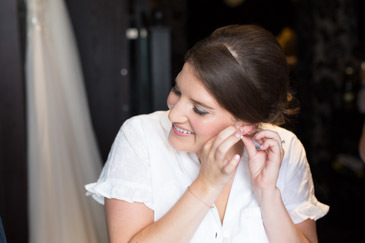 So, don’t stress about how clean your dress is on your wedding day – just have fun! I hope these tips help you enjoy wedding dress shopping as much as I did. 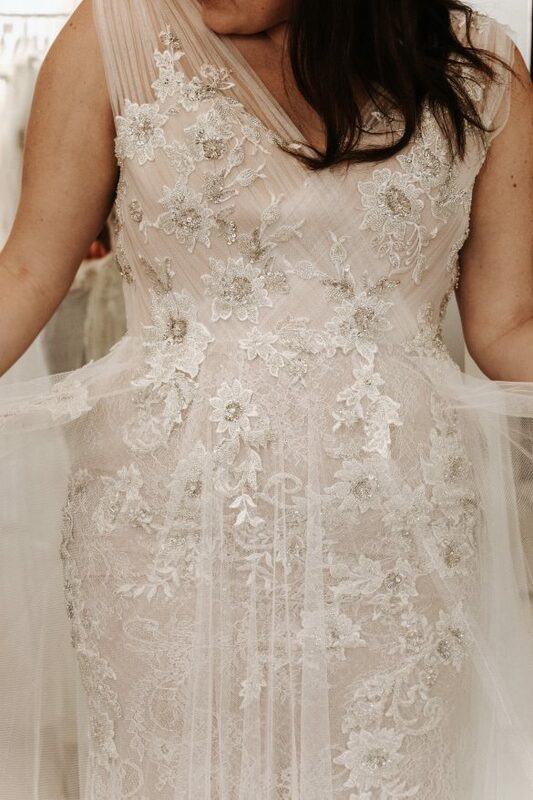 I’d love to hear your dress shopping stories (the good AND the bad!). Share your story in the comments below! Amusing! Weeding is one of the precious memory of life. Thanks for sharing the best ways to choose the best dress.